It surprisingly doesn’t happen more often, but back in the 80s there were a couple notable occasions when TV broadcast intrusions were accomplished. 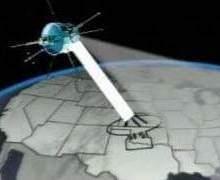 Back in the early-80s, satellite dish owners were responsible for owning and servicing their own equipment but had access to any satellite-broadcasted programming including that of cable providers. 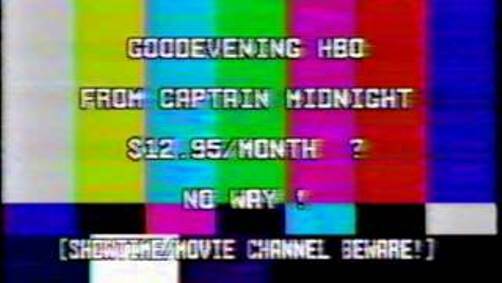 In the mid-80s, cable channels began scrambling their programming and charging fees to home satellite dish owners who accessed the signals requiring many satellite dish owners were forced to purchase expensive descrambling equipment in addition to paying monthly or annual subscription fees to cable programming providers. When HBO scrambled its signal, it offered subscriptions to home dish owners for $12.95 per month, which was either equal to or slightly higher than what cable subscribers paid. Dish owners were not happy and it triggered a national movement among dish owners to more strongly regulate the cable industry and force them to stop anti-competitive pricing. One individual decided to send his own message directly to HBO letting them know his feelings. Not sure how many of those subscribers were tuned in at that hour, but I am sure they were a little pissed off that their movie was interrupted in such a fashion. Other than that, MacDougall’s message was fairly innocent and did not do any harm. He chose the name “Captain Midnight” from a movie he had recently seen, On the Air Live with Captain Midnight (not the 40s radio show). After media pressure forced the FCC to take some action, MacDougall was charged and plea bargained a $5,000 fine and was placed on just one year’s probation. To this day, MacDougall still owns and operates MacDougall Electronics, a satellite dish dealership, in Ocala, Florida. The following year, another TV broadcast intrusion occurred on an even-bigger scale. The intruder, wearing a Max Headroom mask, was able to interrupt two television stations in Chicago, Illinois within three hours on the evening of November 22, 1987. These acts were more disturbing and seemed to lack any specific purpose or message. The first incident took place on WGN during its primetime 9pm newscast when a person wearing a Max Headroom mask appeared. There was no audio, only a buzzing noise, and it was stopped after only about 30 seconds when engineers switched over to an alternate transmitter once they figured out what was going on. When sportscaster Dan Roan returned to air after the incident, he said “Well, if you’re wondering what happened, so am I.” I am sure anybody tuned in to that broadcast was momentarily confused, but not as much as those watching another channel later that same night. Creepy! It is so manic and disjointed, yet these guys must have been pretty smart in order to hijack the signal. Unlike the “Captain Midnight” occurrence, WTTW was not able to stop the intrusion and neither the hijacker nor the accomplices have ever been found or identified. That’s a long time to keep a secret! I am surprised they never tried it again, but I guess they were smart enough not to press their luck. The Max Headroom incident made national headlines and to me, is a truly fascinating moment in 80s pop culture history. @pikachulover Sounds like that could be an interesting angle for a story. I was using broadcast intrusions as the inspiration of a story I'm writing. We've discussed the Max Headroom intrusion in the past, but I don't recall the Captain Midnight one. Too bad this type of mischief isn't a thing anymore. Now the only video oddities are peculiar YouTube uploads.